Nestled in the Himalayas, Darjeeling is situated at an altitude of 2134 meters. 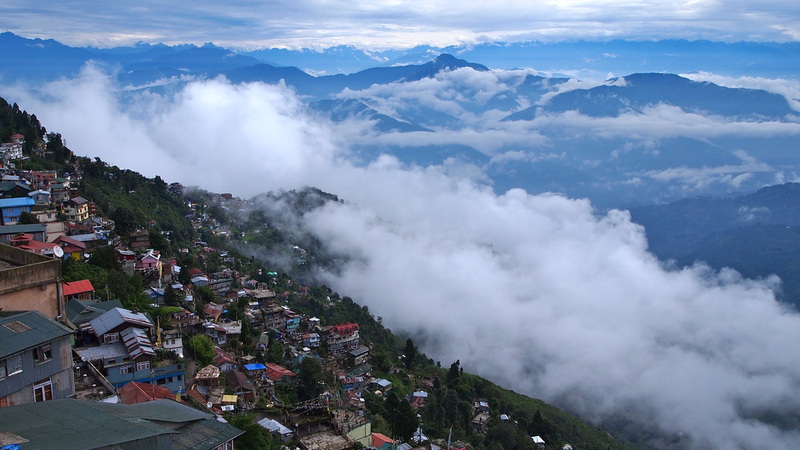 The name of the town has been derived from "Darjeeling" meaning 'the place of the Dorje - the Mystic. To most International visitors, the name "Darjeeling" brings to mindthe best quality 'tea' in the world. Bearing testimony to this, are over 70 teagardens close to the town. The Darjeeling Toy Train (declared a World Heritage Site by UNESCO in 1999) chugs alon from New Jalpaiguri and reaches Darjeeling after traversing through jungles, rice paddies, tea gardens and pine forests, making this " a journey to remember". LOCAL TRANSPORT: Private Taxis, Jeeps and Land rovers are available for local sightseeing in and around Darjeeling. AIR CONNECTIONS: Bagdogra Airport is 90 km (3 hours) from Darjeeling. RAIL CONNECTIONS: Out-station trains (Indian Railways) generally come into either New Jalpaiguri or Siliguri. From there, visitors may proceed to Darjeeling by 'Toy Train" (journey time 6.5 to 7 hrs) or bus or taxi or Limo Van (journey time 3 to 3.5 hrs) to Darjeeling. TOURIST CARS/BUSES: Tourist Cars, Tourist mini coaches and Taxis are available for transfer of passengers between Darjeeling and Siliguri/New Jalpaiguri Junction/ Bagdogra, and also for sightseeing at fixed rates and may be reserved through Tourist Bureau, Govt. of West Bengal, Darjeeling.